The latest research report by Zion Market Research (ZMR) states that the global customer relationship management (CRM) services market is representing an enormously aggressive business environment with the charisma of a number of dominating market players. Oracle Corp., IBM Corp., Tata Consultancy Services Limited, Wipro Limited, Salesforce.com Inc., Microsoft Inc., Nimble Inc., NetSuite Inc., SAP SE, SugarCRM Inc., Sage CRM Solutions Ltd., Amdocs Ltd., and Ramco Systems Ltd are some of dominating players in the global customer relationship management (CRM) services market. CRM denotes various practices and approaches used by firms to study the customer data and interaction with the intention of retaining customers as well as increasing the company sales. CRM is utilized by numerous firms to advance the relationship with their customers by analyzing the customer data throughout the customer lifecycle. It offers information about the customer when a contact between company and customer occurs using numerous channels. These channels include telephone, company website, direct mail, live chat, social media, and marketing materials. The company personnel handling customers also can supply customer data such as their personal information, purchase record, buying behavior, and buying inclinations in the CRM system. Increasing inclination of numerous companies to focus on customer engagement is driving the global customer relationship management (CRM) services market. Rising competitive atmosphere with the emerging small-scale and medium-scale firms in the global customer relationship management (CRM) services market is driving the global customer relationship management (CRM) services market. Effortless installation procedures of the CRM software and services are boosting the global customer relationship management (CRM) services market. The need for maintaining a superior customer relationship on the global level is pushing the firms to consistently improve their CRM services and systems. This push for the improvement is propelling the global customer relationship management (CRM) services market. Nowadays, each firm possesses its distinct business units. So, the requirement for the separate CRM services and solutions for these business units is supposed to fuel the growth of the customer relationship management (CRM) services market globally. The segmentation of the customer relationship management (CRM) services market is done based on the application, deployment mode, vertical, and region. 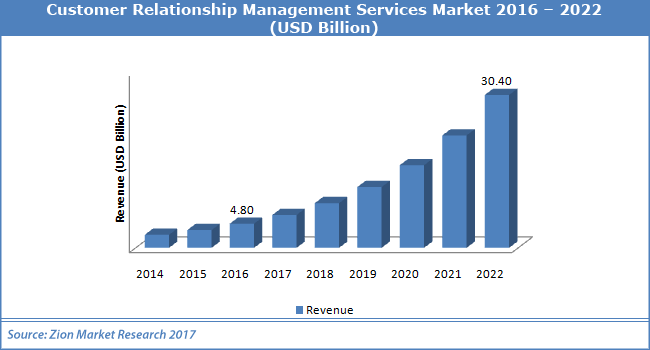 All the customer relationship management (CRM) services market segments have been studied on the basis of current and upcoming trends to estimate the global customer relationship management (CRM) services market from 2016 to 2022. The deployment mode segment from the global customer relationship management (CRM) services market in the latest research comprises of on-premises and cloud. Application segment from the global customer relationship management (CRM) services market comprises of sales, marketing, customer support & services, and others. The vertical segment from the global customer relationship management (CRM) services market comprises of government, BFSI, healthcare, retail, manufacturing, and others. The regional segmentation of the global customer relationship management (CRM) services market includes the present and future CRM services demand for Europe, North America, Latin America, Asia Pacific, and the Middle East & Africa. This segment from the customer relationship management (CRM) services market is further bifurcated into most important countries such as France, the U.S., the U.K., China, Germany, Japan, India, and Brazil. The customer relationship management (CRM) services market for the Asia-Pacific region is encountering a huge growth in the upcoming period owing to increase in the demand for the CRM products and services in these regions, along with an increase in business scope, customer pool, and rise in a number of startup companies. Middle East regions are also supposed to have a towering CAGR in the upcoming period because of the increase in the awareness for CRM solutions and inclination towards a technological upgrade.